Spherical roller bearings can withstand even the most demanding conditions.These roller bearings resist seizure, maintain dimensional stability, can support high radial loads and moderate axial loads, and resist wear in spite of constant vibration, misalignment and shock loads. Performance enhancements include extra precision on the bore and outside diameter; extremely tight radial clearance tolerance; and super- finished, specially heat-treated rollers with superior shock load capacity. The NSK series include: HPS series offering longer operating life and higher limiting speeds, CA for harsh vibrating applications, CAM-VS that resist seizure, maintain dimensional stability and resist wear, and EVB series for high vibration conditions. • Design – Elimination of the guide ring allowed for a design change that improves cage balance and strength. • Material Technology – HPS series is made from NSK’s high-cleanliness Z steel. • Special surface treatment increases resistance to wear. • NSK also offers advanced material options: Super TF and TL steel, depending on application requirements. • Advanced Technology - NSK’s patented Molded Oil lubrication system is also available. • Seal Technology - NSK offers different sealing materials depending on the operating temperature of the bearing. • Cage Materials – Available in steel, brass or polyamide depending on the requirements of the application. • Manufacturing Technology – Advanced production system guarantees outstanding quality control. 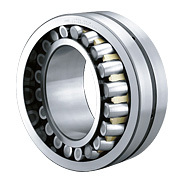 • Life – up to 2 times the operating life of industry standard bearings. • Reduced maintenance costs – downsizing to smaller bearings while improving performance and lengthening equipment operating life. • Limiting speed up to 20% higher.